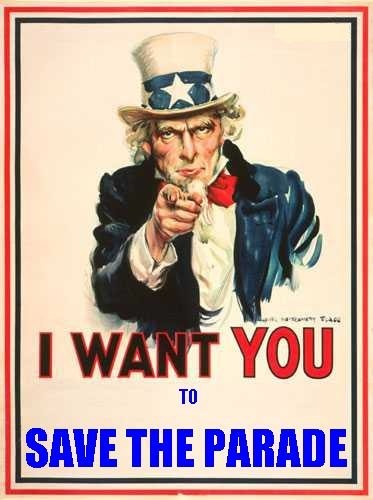 Only YOU Can Make the Memorial Day Parade a Reality! Not just Uncle Sam, but all of New Rochelle and our Military Personnel need YOUR help. This years Memorial Day parade is in jeopardy and without the support of the community, the parade will suffer. The United Veterans Memorial and Patriotic Association of New Rochelle is asking for donations to assure the parade will continue its contribution as the preeminent Memorial Day event of the region. The New Rochelle Memorial Day Parade is an event that New Rochelle residents have enjoyed for the past four years. Each year the parade has grown larger and better. A part of the day has also included the after-parade-event at Hudson Park. In the past this event has been filled with music, good food, military vehicles and helicopter static-display, fun for the kids and so much more. The planning process, which is monumental, is underway for this year’s Memorial Day Parade. Remembering the sacrifices made on our behalf by our brave veterans is a most important and worthy endeavor. Honoring and showing our appreciation for the many troops who are brought up to New Rochelle on Memorial Day during “Fleetweek” is also the least we can do as they serve our country in Afghanistan and other places overseas. The appreciation and gratitude they receive here in New Rochelle has become something that the troops remember and talk about for years afterword. There is something everyone, including you, as a resident or business owner in New Rochelle can do to be a part of this most important day. Due to financial constraints, the City of New Rochelle is paying for less of the Memorial Day Parade expenses this year. You can show your appreciation and gratitude for our veterans and troops by helping the United Veterans Memorial and Patriotic Association of New Rochelle pay the cost of this very special day. You can send a donation to them, UVMPA of New Rochelle, 112 North Avenue, New Rochelle, N.Y. 10803. You can save the date, Monday, May 28th, 2012 Memorial Service 10:30 a.m. at Memorial Plaza (adjacent to the New Rochelle Public Library). Parade kicks off at 11:00 a.m.
Do you own a business? Think of the appreciation and support the crowds will give your company when they hear your name announced as a proud supporter of the parade. Public or private, every bit counts, but make no mistake, now is the time to do it. Don’t leave it up to someone else, and don’t miss this opportunity to be a part of a truly spectacular event. Won’t you please join us as we remember on Memorial Day, May 28th and be a part of the appreciation we show our veterans and the gratitude we show our troops. They pay the price for our freedom; help us pay the cost for their special day of remembrance. We need to raise $30,000 dollars for this year’s event. Our Vets and troops gave their best for us. Please be as generous as possible for them. Thank you all in advance. If you need further information about Memorial Day please contact Peter Parente at (914) 557-5556 or post a comment. Remember, they’ve done their part, so let’s do ours.